Here is my review of "The Shop Around the Corner". but until recently I didn't know there was an original version (what with the completely different name). there is no way for someone like me to know! I usually look at the trivia link of a movie on IMDb and/or read the Wikipedia article. Through IMDb I knew for example after watching "You've Got Mail" for the first time, that it was a remake of "The Shop Around the Corner"
do you actually read all that info for every movie you watch though? I usually skim through the Wikipedia article (as I link to it with every one of my reviews). I usually skip the plot summary (not needed because I just watched the movie) and read the critical reactions and trivia stuff. So it is usually not much to read. Before I started reading the Wikipedia articles I always read the trivia page on IMDb (now I am not always doing that). I am sucker for movie trivia. First you're hot, then you're not...and then you're Alex Fletcher. So when the sizzlingest tween queen on the charts asks the has-been '80s pop sensation to write her a song, he grabs for another chance at stardom. Problem: Alex can say it with music, but he sure can't say it with words. Enter Sophie Fisher, his beguiling if quirky plant lady, who has an unexpected green thumb for lyrics. Together, they go after songwriting success – and discover that if you want to write the perfect love song, it helps to fall in love. With Hugh Grant and Drew Barrymore at the keyboard and Marc Lawrence (Two Weeks Notice) directing, Music and Lyrics is a witty, wacky romantic comedy that faces the music...and laughs! A good feel-good movie. And as I like Drew Barrymore rom-coms and also enjoy Hugh Grant's rom-coms, this was a no-brainer to get. This is the second time I have watched it, and I think this time around I enjoyed it even more than the first time. Hugh Grant is perfect as the has-been pop idol. Drew Barrymore is as cute as she is always in romantic comedies. Gwen (Catherine Zeta-Jones) and Eddie (John Cusack) are America's Sweethearts - the country's favorite couple, on-screen and off. But when their very public romance turns into a very private breakup, only veteran press agent Lee (Billy Crystal) and Gwen's assistant Kiki (Julia Roberts) can help Gwen and Eddie show some love while they promote their last film together. But the press junket is in a resort hotel miles from anywhere, and while Lee and Kiki frantically try to keep the media away from the real story - and keep Gwen and Eddie from revealing their secret - Kiki finds something entirely unexpected in this romantic comedy about true love, happily ever after and other Hollywood endings. I haven't watched this one in a while. I remembered it as rather boring. So I was surprised that I really enjoyed it. Billy Crystal as the manager/PR guy is great. And I liked Julia Roberts as Kiki. Hank Azaria as the lisping Spanish guy is hilarious. Also fun was Seth Green in the small role of Billy Crystal's "apprentice". And what's not to like about Christopher Walken as eccentric film maker. In 2035 A.D., robots are programmed to live in perfect harmony with humans and have become part of everyday life on Earth. When a brilliant scientist at the U.S. Robotics Corporation is found dead, Chicago Detective Del Spooner (Will Smith) is called in to investigate. Aided by robot psychologist Dr. Susan Calvin (Bridget Moynahan), Detective Spooner uncovers the possibility that a robot may be the primary suspect in the case. But as Spooner gets closer to the truth, he gets caught up in a race for his life, when robot intelligence attempts to shut down his investigation. With time running out, a deeper threat emerges from the core of a mechanized world that challenges the very existence of mankind. Essentially this could have been a real fun action popcorn movie, but I cannot get over the cheap looking special effect. There is not a moment where I couldn't forget that they were acting in front of a green screen. There were a lot of moments where the actors just didn't really match with the background (lighting etc.). Alan Tudyk (Wash from Firefly) is "playing" the robot Sonny. A fun surprise to see here was Chi McBride as Will Smith's boss, who is the guy who played Emerson Cod in Pushing Daisies. Eva Longoria Parker (TV's 'Deperate Housewives') stars in this devlishly funny romantic comedy about holding onto the ones you love...even after you're gone. When Kate (Longoria Parker) is killed by an ice sculpture on her wedding day, her fiancé Henry (Paul Rudd, 'Knocked Up') gives up on romance until he falls for the beautiful psychic (Lake Bell, TV's 'Boston Legal') who's supposed to be helping him move on. But Kate's not having it, and now she's making it her heavenly duty to send their budding relationship six-feet-under. This was a complete blind buy. Only after buying it I looked it up on the internet which set my expectations low when I read that it only had 15% on RottenTomatoes. But I was very pleasantly surprised. I really enjoyed this movie. The interactions between Ashley (the "psychic") and Kate (the ghost) were funny. Kate came back from the dead to haunt the new prospective girlfriend (Ashley) of her fiancé. Also it was nice to see Lindsay Sloane again. And Stephen Root seems to be very busy lately. I see him in movies and on TV shows more and more often lately. This is my favourite Jim Carrey movie. This movie was released before there was Big Brother. At the time this seemed a little like Science Fiction, but not long after people voluntarily did go on TV shows with being filmed 24 hours a day. It is sad to think that Truman had to go through this fake life. The most disturbing is that his best friend since he was seven is the one most responsible to hide the reality from Truman. It has been years since I saw that movie... I may have to pop that one in myself! I always like the audience moments in The Truman Show, like the guy holding onto his shower curtain, willing Truman to survive! Wonderful stuff. As an age old battle rages amongst the stars, Kainan's ship burns brightly as it crash-lands into the Nordic coast. 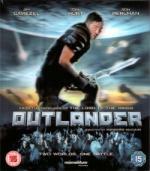 His space ship comes to rest in the fjords of ancient Norway and it's with dismay that Kainan (JIM CAVIEZEL) realises that he is not the only survivor, as a second passenger, the Moorwen, also emerges from the wreckage. A hellish, fire-breathing monster, the Moorwen is intent on causing havoc and destruction to those it has perceived to have wronged it. As the Moorwen kills everything in its path, Kainan must work together with a tribe of fierce warring vikings to destroy the blood thirsty beast before it kills them all. The movie begins with a man from another planet crashlanding on the earth in 8th century Norway. There he encounters a Viking town where he becomes known as the "Outlander" (they of course think he is only from another land). Sadly he brought a dragon-like beast with his ship which is now loose. Now he has to gain the trust of the Vikings and battle the beast. This movie is well done. Story-wise nothing new, but fun nevertheless. It is a mixture between Sci-Fi (mostly in the beginning) and Viking movie during most of the rest. And becomes a Horror movie at the end (I was a little reminded of "The Descent"). "Weißblaue Geschichten" (lit. "White-and-blue stories", the colors of the Bavarian flag) is an anthology series with Bavarian slice of life stories. It has aired since 1984. The star of this series was Gustl Bayrhammer until 1993 (the year he sadly died). This was one of the series I loved to watch. It was one of the few series I had watched with my parents instead of going to my room and watch something else. I haven't seen it since the mid-90s and I am surprised how much I still like the episodes. This set includes 18 of the produced 22 episodes which star Gustl Bayrhammer. For unexplained reasons, four episodes are not included. Sadly one of those is an episode which did leave a lasting impression with me. At least I think it was from this series. It was an episode guest-starring G.G. Hoffmann (the German voice of Captain Kirk and early Sean Connery).